The primary goal after your home has suffered smoke or fire damage is to restore your life and recover your property. 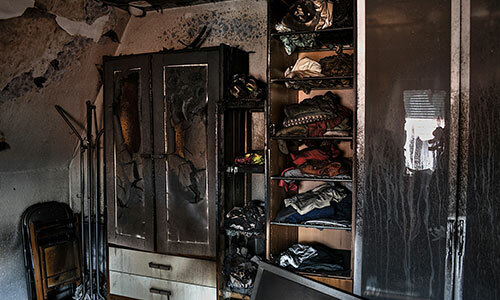 At Wall 2 Wall Restoration, we offer fire damage restoration services for residents and business owners in the Greenwood area that have been the victim of a house fire or have ionized smoke that has latched onto surfaces in the home. We provide quick smoke and fire restoration services to save your property and help you get the compensation you deserve from your insurance company. Call Wall 2 Wall Restoration (479) 343-1595 for a prompt fire restoration service. Place clean towels or linens down on flooring in high-traffic areas to prevent the spreading of soot to other portions of the structure. Remove and secure valuable possessions, jewelry, guns, cash, coins, collectibles, and documents. Do not re-enter your home or business until the structure is deemed safe to do so. Do not attempt to wash the walls or other painted surfaces. Do not attempt to clean or shampoo carpet or upholstery. Do not attempt to repair or clean any electrical appliance that may have been close to the fire, heat, or water. Do not turn on ceiling fans or other fixtures. Do not touch surfaces. Soot can permeate upholstery, walls, and woodwork, causing further damage. Do not eat or keep food that could have been exposed to the fire or smoke. Do not use a common household vacuum to remove soot or residue. Do not attempt to remove or touch exposed wiring in the structure. When you call our Greenwood fire restoration company, we will secure the property via fencing, locks, and board-ups to prevent theft or vandalism after a house fire has occurred. We will also assist in securing personal valuables and other items that may be salvaged before we assess the fire damage. Our skilled technicians will make sure the structure is safe for re-entry and further inspection after the initial loss. Proper assessment of the type of fire, the scope of fire and smoke damage, and the extent of any resulting water and mold damage secondary to the fire or smoke is of vital importance in our fire restoration plan. We offer complete fire and water restoration services to address any kind of damage to your home or business. Our team at Wall 2 Wall Restoration will then contain the property against secondary fire damage by drying out the structure, removing contents and other items for cleaning or salvage, taking inventory of personal property, and documenting the losses for your insurance company. We will also remove any fire debris, such as ashes, soot, and rubble, to prevent the spread of contamination and isolate the non-affected sections of the structure. Those items which can be cleaned or repaired will be documented and safely removed to our secure, off-site warehouse for further processing as part of our fire damage restoration process. Wall 2 Wall Restoration will also remove any potential water or mold damage by thoroughly drying out the structure and disposing of any wet materials, such as carpet, padding, drywall, or insulation. Our water extraction and mold removal process helps to prevent any further damage to the structure, so you can proceed to rebuild without worry. Our team will then begin the removal of all smoke damage and soot that has collected in the affected areas. If left and not properly cleaned, this smoke and ash can cause a tremendous health hazard to everyone and everything in your home or business. We will clean all affected areas with our specialized fire restoration equipment to ensure that your property is safe and secure. Finally, our team at Wall 2 Wall Restoration will properly remove all unpleasant odors left behind from the fire and smoke. We will utilize an array of specialized odor elimination equipment to ensure that all odors from the incident are permanently removed from the affected areas of your home or business.